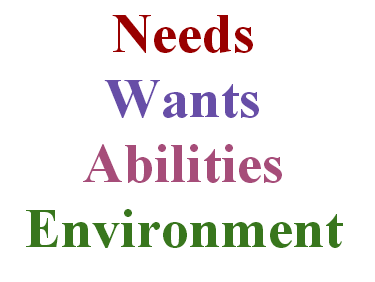 I've been thinking about how our needs, wants, abilities and environment can direct our course in life. What we expect of ourselves and others is born of this process. It requires honesty. This comes with time, too. No one would expect a 6 year old, or even a 20 year old to accurately gauge their needs, wants and environment. For one thing, some of these things are changeable. Some abilities can be learned. The environment may change. What we want when we are five may be far different from when we are twenty-five. What I cared about at 25 is quite different from what I care about now, at 51. I've been thinking about all of this in light of autism as well, as this month is Autism Awareness Month and Autism Acceptance Month. How do I help my son look at his needs, wants, abilities and environment? I, at 51, can see some things that he cannot. I, because of my experience and abilities, can see some red flags that he cannot. I accept my son fully as he is and fully expect that he will continue learning and growing as he can. I did not stop growing and learning at 20, and don't expect to stop learning and growing at 51. Our family will learn and grow together. We will accept everyone's needs, wants and abilities. An example from today was when my son asked, "Is it okay to clap-dance or not?" (Lots of people with autism do a hand movements, my son's involve clapping) . And the answer to that is yes, here in the family room at 10 a.m. but no not in your sleeping brother's room at 5 a.m.
Learning and growing is a messy business. Sometimes people have competing needs and wants. Sometimes people have differing abilities. Fact of life, not everyone's wants will be met all the time. Sometimes there are road blocks in our environment. Sometimes our abilities don't match the task at hand. It's not always easy to sort these out. But when we gauge it right, it is beautiful. That's my hope for the future. My son's graduation from school is a big milestone. B. I. G. I don't think I can overstate it. It will mean a BIG adjustment on his part and our parts as well. But it is not the end of his story any more than my graduation from high school was the end of my story. It's the end of one chapter, and the beginning of another.